(Newser) – What President Trump did or didn't say in a condolence call to the pregnant widow of US Army Sgt. La David Johnson has been the subject of controversy for days, and now Myeshia Johnson herself has weighed in. 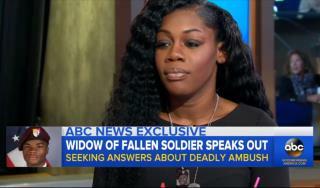 In a Good Morning America interview with George Stephanopoulos, Johnson describes what hurt her "the most": hearing President Trump "stumbling on trying to remember my husband's name ... my husband is out here fighting for our country and he risked his life for our country why can't you remember his name?" She says "the only way he remembered my husband's name is because he told me he had my husband’s report in front of him and that’s when he actually said La David." On Twitter, Trump countered that: "I had a very respectful conversation with the widow of Sgt. La David Johnson, and spoke his name from beginning, without hesitation!" Funny how this family is the only one complaining and keeping themselves in the spotlight, with a little help from the female Al Sharpton. It's just LaDavid minus a few trophy parts. Ditch the Ebonix girl, you've gone Prime Time.